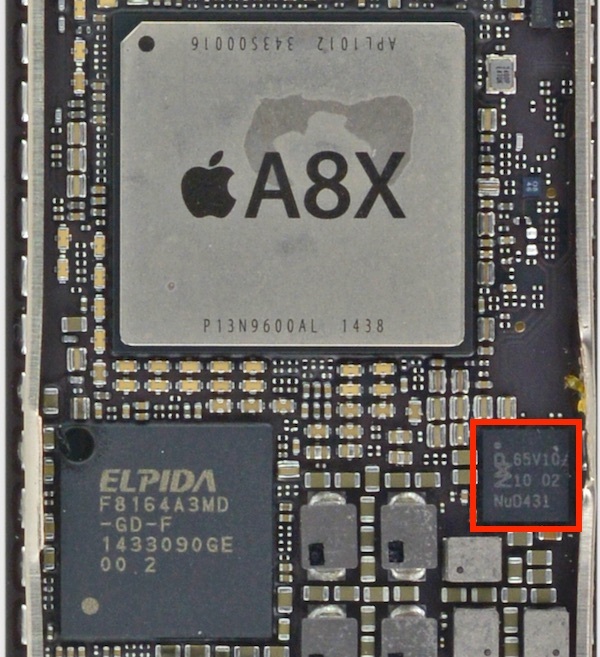 Earlier this week, a teardown analysis of the iPad Air 2 by iFixit surprisingly revealed the presence of a near field communications (NFC) controller chip that is identical to the one inside the iPhone 6 and 6 Plus. Apple never advertised the Air 2 as having NFC, and the tablet doesn't support contactless Apple Pay payments, so the inclusion of this chip is somewhat puzzling. In a new article, Gigaom examines the reasons why Apple might include but not activate this hardware in its tablet device, speculating that the chip may eventually serve to help small businesses process payments. In this scenario, the iPad Air 2 would serve as a cash register, potentially using the onboard NFC chip to process wireless Apple Pay payments without any additional hardware. The iPad already is gaining traction with small retailers for use as a mobile register, often in conjunction with a credit card reader and processing service such as Square. But with Apple Pay rolling out as an NFC system for payments, Apple could be eventually be looking to help retailers accept such payments with its hardware. The key to NFC in the iPad Air 2 is that it affords the possibility of becoming an Apple Pay cash register with no dongle needed. Conceivably, it could expand the number of outlets that take Apple Pay from around 40 to anyone selling stuff who owns the latest iPad. It brings Apple Pay out from the big box store and into farmers’ markets and boutiques. Such a system would appear to complement rather than replace existing credit card implementations used by small businesses, as Apple Pay currently has only limited distribution through the iPhone 6 and 6 Plus and retailers would still need to accept traditional credit and debit cards. Businesses also still require credit card processing arrangements through either a bank or a separate payment service such as Square. Apple Pay launched earlier this week with only a few hiccups in an otherwise smooth release. Early reports were favorable with most users noting that transactions were processed quickly and easily. Its biggest limitation is distribution, with only large chain launch partners officially accepting the payment service. But as Apple Pay evolves, it will be interesting to see whether the NFC-equipped iPad Air 2 and small businesses will play a bigger role in Apple's mobile payment plans. Update: As pointed out by a number of readers, the lack of NFC antennas in the iPad Air 2 leaves it unclear how the iPad Air 2 could be used as payment receiver. Forum member GekkePrutser notes that the chip is likely included in the iPad because it houses the secure element where Apple Pay data is stored for the in-app payment feature that is supported on the new iPads. I think that they included this chip not because of the NFC functionality but for the included Secure Element (http://www.smartcardalliance.org/publications-nfc-frequently-asked-questions/#7) which safely stores the payment keys. This supports Apple's story that you can still use Apple Pay for online transactions, just not in person ones. Thus NFC is not needed but the secure element is. It's much harder for a malicious app or hacker with hands-on access to the device to pry the keys from the secure element than it is from the normal flash memory, as it's tamper resistant. It's basically a smart card (similar to the "Chip&Pin" EMV chip in a normal payment card), it's also a bit like a TPM module in Windows laptops/tablets. Also notice that while the iPad includes the NXP65V10 it does not include the iPhone 6's AS3923 NFC booster chip which Apple uses to interface with the antenna. Without this its strength will be too weak to actually use NFC unless there was a fairly large antenna somewhere (and there is no space for that on the casing as it would have to be behind a plastic cover). So I don't agree with the conclusion in the Gigaom article. While I would have loved to see NFC in the Air 2, I don't think it has the actual NFC functionality and in my opinion that's not why the chip is there. They could have gone for a Secure Element chip without NFC but it would probably have required making new drivers, which probably wasn't worth the hassle as these chips won't be very expensive to begin with. "It brings Apple Pay out from the big box store and into farmers' markets and boutiques." Incredibly smart idea.....should be interesting to watch. Heck, those small farmers markets and boutiques that use iPads as their POS systems are more advanced than the big-box stores who's systems are still stuck in 1999. Didn't iFixit find that there were no NFC antennas, despite the chip being present? There wasn't any NFC antennas in the device from iFixit, but it's unusual to include a chip and not have plans for it. Perhaps it'll be an add on later? How would an antenna be added later? For all the people complaining about Apple's decisions, this should prove something. You guys crack me up. "a few hiccups in an otherwise smooth release". You think people getting duplicate charges is a "hiccup"? Wonder how you'd feel if one of those hiccups was a $5000 item and the duplicate brought you over your credit limit and screwed your card. Right...smooth with just "a few hiccups". That was on the payment processor's end, and has been caught & fixed. Chase explicitly said it wasn't anything on apple's end that caused the issue. I have been double charged before when using a regular magnetic card. It's a tiny bit of hassle, but usually easily rectified. If true, I think this would help Apple pay adoption significantly for 500 dollars a business can accept NFC payments? Yes please. Care to elaborate on your sensationalized post? Elaborate on what? I worked at Best Buy - that POS system was so archaic and heavy. Why do you think it's taken so long for the US to FINALLY switch over to new forms of payment (specifically chip-and-pin)? Our retailers are so large and take so long to adopt new technologies it leaves us behind other countries. Glad things are finally accelerating. Is it too far fetched to perhaps consider a POS that can connect to an iPad over the lightning connector that is equipped with an NFC antenna? That could be a way.